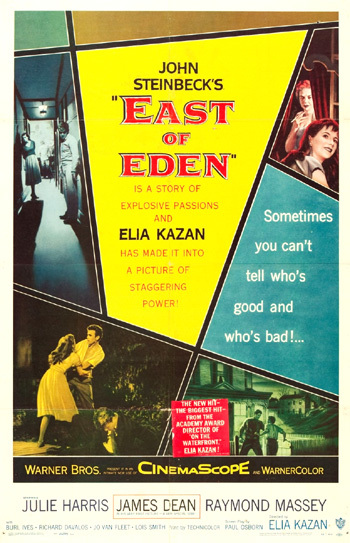 East of Eden is a story of explosive passions and Elia Kazan has made it into a picture of staggering power. The film, set in 1917 at a time just before the US entry into World War I, portrays the relationship between insecure, tortured, neurotic loner Caleb "Cal" Trask (James Dean, his first major role and film) and his dutiful, favored brother Aron (Richard Davalos) - twin sons. Their father is a stern, hardened, devoutly religious, self-righteous man, Adam (Raymond Massey), a lettuce farmer living with his family in Salinas, California. You're right. I am bad. I knew that for a long time...It's true. Aron's the good one. I guess there's just a certain amount of good and bad you get from your parents and I just got the bad. ...she ain't no good and I ain't no good. I knew there was a reason why I wasn't (good)...I hate her and I hate him too. Cal also worships Abra (Julie Harris), his brother Aron's sweetheart. Next to a lettuce field, when a Mexican field worker who is interested in Cal interrupts a talk he is having with Abra, she advises him to tell the jealous woman that she is his brother's girl, but Cal counters with: "I don't have to explain anything to anybody." He wanted to tie me down. He wanted to keep me on a stinking little ranch away from everybody. Keep me all to himself. Well, nobody holds me...He wanted to own me. He wanted to bring me up like a snot-nosed kid and tell me what to do...Always so right himself, knowing everything. Reading the Bible at me! She praises her own successful brothel business and the town's hypocrites: "I've got the toughest house on the coast - and the finest clientele. Yeah! Half the stinking city hall go there." Cal requests and receives $5,000 from her to finance an investment in profitable beans, to aid his father who has failed in a costly scheme to refrigerate lettuce (and to "buy" his father's love). In the memorable "Ferris wheel" scene, Abra confides and confesses to Cal that she thinks she isn't good enough for Aron. Their intimate conversation leads to a kiss, but then she pulls back immediately: "I love Aron, I do, really I do," hurting Cal tremendously. You will have to give it back....I sign my name and boys go out and some die, and some live helpless without arms and legs. Not one will come back untorn. Do you think I could take a profit from that? I don't want the money, Cal. I couldn't take it. I thank you for the thought, but...I'll never take it! Son, I'd be happy if you'd give me something like, well, like your brother's given me, something honest and human and good. Don't be angry, Son. If you want to give me a present, give me a good life. That's something I could value. Filmed with a slanted camera angle, Cal (with aching and self-pity) completely breaks down with the money splayed out in his hand as he attempts to hug his father. Don't you ever touch her again! I don't trust you. You're no good. You're mean and vicious and wild. And you always have been. You know it too, don't you? Father and I have put up with every mean and vicious thing you could think of ever since you were a child, and we've always forgiven you. But now, I don't want you to go near Abra. I don't want you to talk with her. Just stay away from her. Cal retaliates by revealing "the truth," taking Aron to their mother and revealing the secret lies about their mother and her sinful profession. Mother, this is your other son Aron. Aron is everything that's good, Mother. Aron, say hello to your Mother. Her words bring about a reconciliation between Cal and his father, and Cal sits at his father's bedside to care for him. Adam asks Cal to stay with him and care for him, instead of the detested nurse. Cal tells Abra the good news: "He said, 'Don't get anybody else.' He said, 'You stay with me and you take care of me.'" And then Cal and Abra fully kiss for the first time as the film concludes.